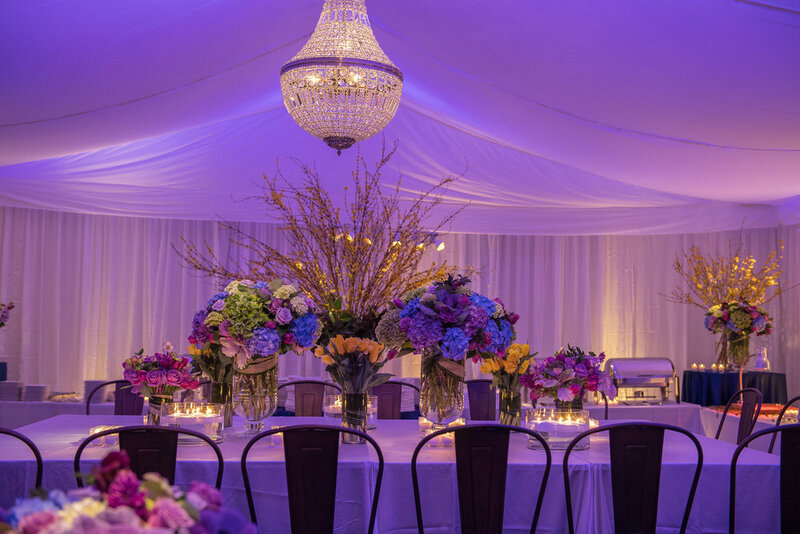 When designing an event, we find lighting to be a highly underrated tool and element of your decor budget we would definitely recommend investing in. The atmosphere of your event can be completely transformed by the utilization of dramatic, or in some cases subtle, lighting. It helps define a space, highlight architectural features, bring attention to beautiful focal elements, detract from not-so-great elements, add to the mood and set a tone. Below we have discussed the different kinds of lighting we utilize and how we use lighting to bring our weddings and events to life! Candles are a great way to add a more romantic and intimate feel. They are an especially nice element to use when wanting to add just a touch of light to a space. One of our favorite looks is a long dining table, lined with tall taper candles in candlesticks. It brings drama and is incredibly effective! 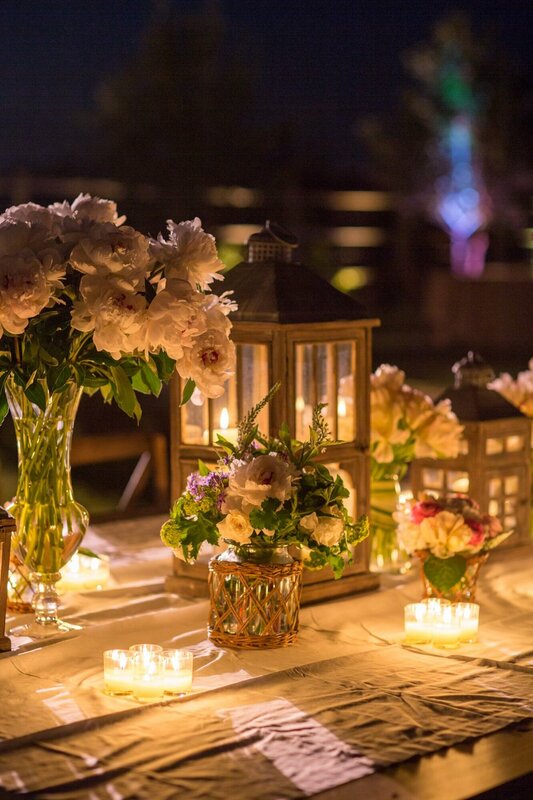 We also love using lanterns, they are a beautiful way to light up long tables or create a pathway from one space to another. Most commonly however, we use votive candles to create ambiance and elevate the mood of a space. We probably use over 200+ votives per wedding, placing them on window ledges, coffee tables in guest lounges, guest tables, bars, you name it! 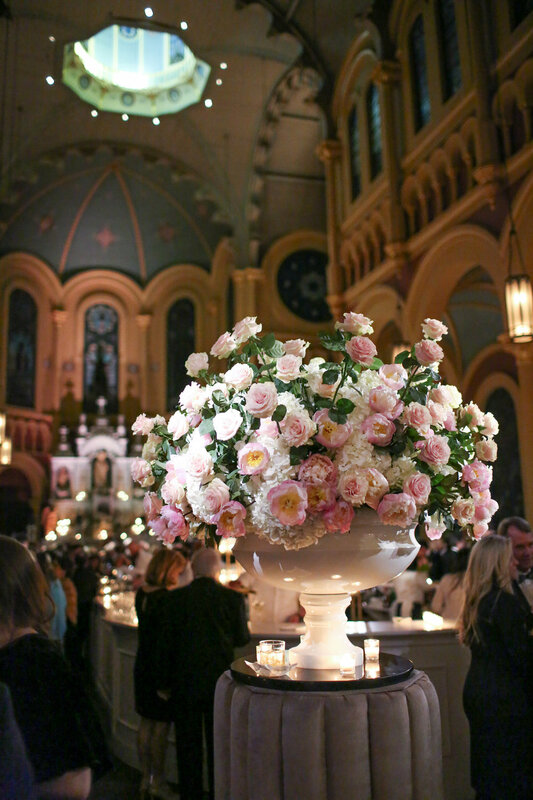 They are one of the most effective tools, especially for those clients looking for a really romantic wedding reception. Market lights are a creative use of lighting to add a cheery, inviting feeling to your event. They add personality to any space and can be strung in many unique ways. We often use them to make a space feel larger, the illusion can lengthen the perception of the room or garden depending on the pattern you hang them. As the sun sets and the stars come out, the bulbs radiate a beautiful glow that create an almost blanket effect over our receptions. We wouldn’t necessarily use these in every scenario however, as market lights can make an event feel a bit more casual. But if that is the look you are going for, then they truly are a wonderful touch! Up-lighting is the most commonly used way to strategically and effectively light a venue. Specifically what we find most beneficial about up lights is that they help to define your space. 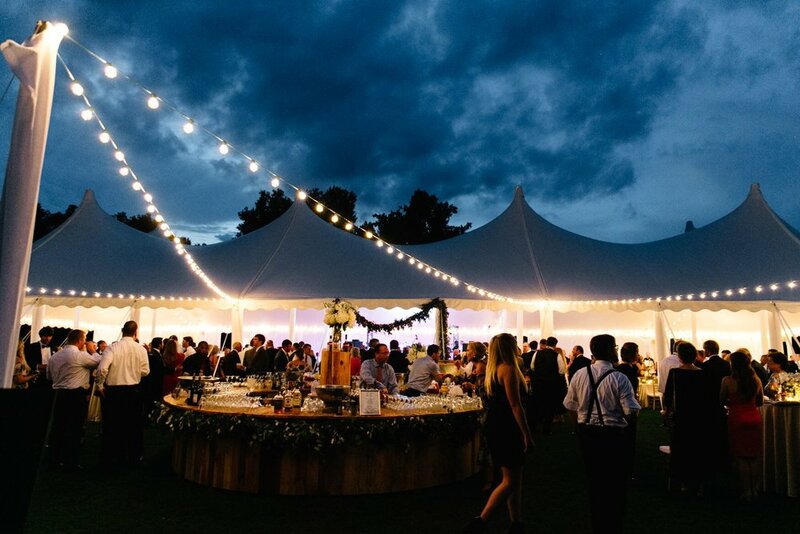 Whether that be by adding warmth to the walls of a cavernous ballroom, or defining the landscaping of an outdoor wedding, up lights give a visual representation of the borders of your event. We also love utilizing up-lighting when needing to add color to an event space. This is especially fun to incorporate into an after party or corporate scenario where we want to represent a company or brand’s colors. 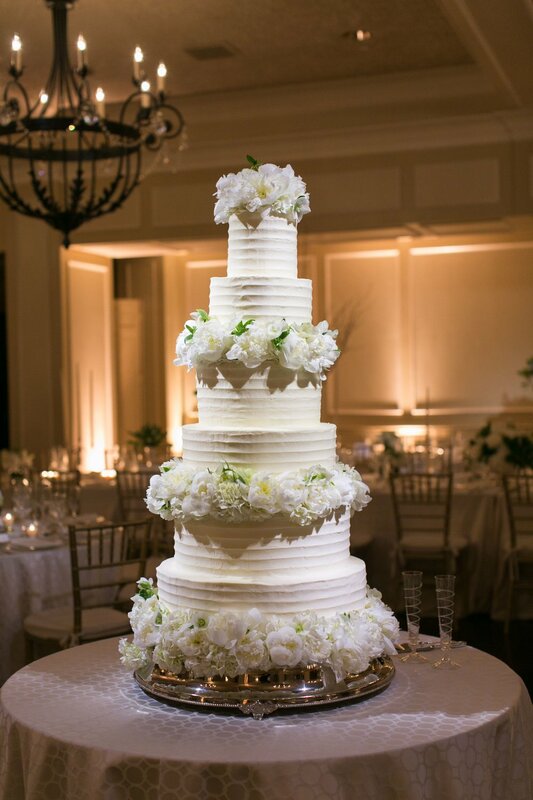 Pin spot lighting can be used to highlight certain aspects of your event, whether it be your cake, floral arrangements, or anything you specifically want to bring attention to! 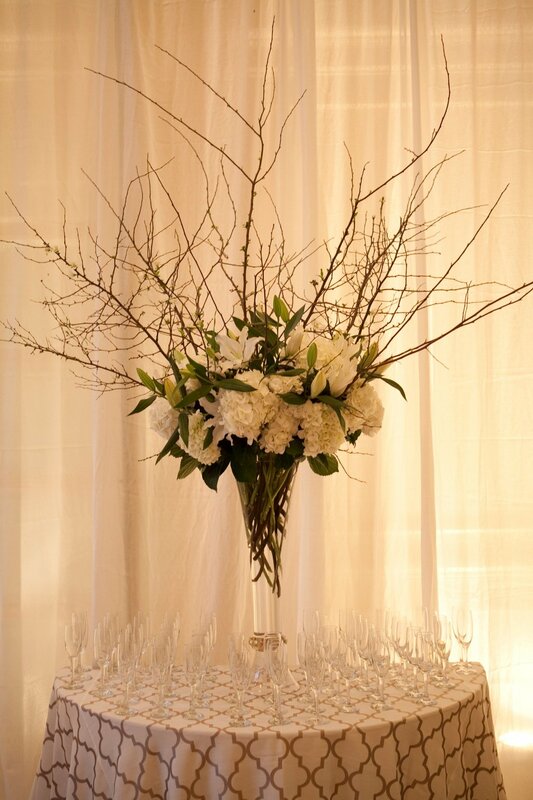 As the party picks up and the lights go down, taller decorative items can become lost in the space. Pin spotting is great way to make things "pop” and stand out. 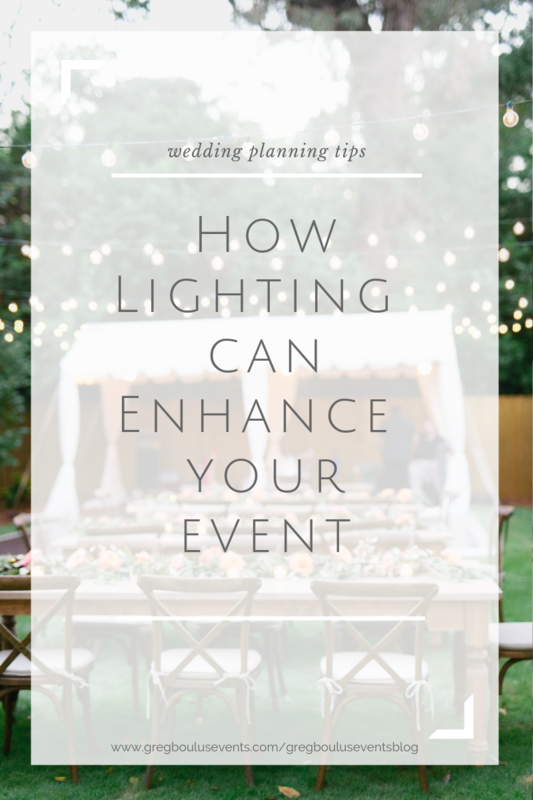 We hope this brings a little bit of insight on the several different forms of lighting we personally use in each and every wedding we produce. Whether it is through fun color or effects that bring personality to your event, or a simple and understated touch, it truly is an invaluable tool that can completely transform your wedding or event. Ask the Photographer: "What if it Rains on my Wedding Day?!" Ask the Photographer: "Do I Need a Wedding Hashtag?" Ask the Photographer: "Should I Book a Bridal Session?" While most couples book an engagement session with their photographers, it is not quite as popular yet for brides to book their own separate bridal session. However our photographer experts agree that booking a separate session for just you can be a very smart decision not only for the photos, but for many other reasons as well, keep reading to learn why! Ask the Photographer: "Why Should We Have an Unplugged Ceremony"
Ask the Photographer: "Why Should We Do an Engagement Session?" Ask the Photographer: "Should We Have a First Look?" Everyone knows that finding the perfect wedding dress is a crucial detail for every soon-to-be bride. However there is another dress that is as equally as important, the one for your beautiful mom! To get the most out of your shopping trip, we collaborated with our friends at House of the Bride and came up with a list of 5 must-know tips for mother-of-the-bride dress shopping!